Having difficulties looking for hydraulic steel tubes? We can help you because we have all sizes. The steel tubes have an NBK finishing where tubes are normalized, phosphate, and oiled inside and outside. Seamless precision steel tubes are also commonly referred to as hydraulic tubes or hydraulic pipes. 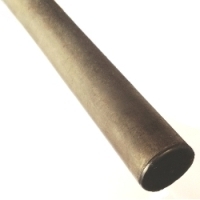 Inch NB Size Range: 1/8" to 2 1/2"
Chuan Kok maintains a large stock of hydraulic tubes in steel material. These steel tubes are in accordance to DIN 2391, the standard specification of steel tubes for precision application such as hydraulic and pneumatic power systems, and DIN 2445, the standard specification of seamless steel tubes for dynamic loads. Steel tubes are available in two kinds of steel material, ST37.4 (E235N) and ST52.4 (E355N). Different materials result from differences in the working pressure that the material can withstand. Grade ST52.4 is a higher grade compared to grade ST37.4, and a higher grade of material quality can reduce wall thickness and weight while maintaining the same working pressure. Different material grades will lead to differences in attributes. For ST37.4, tensile strength ranges from 340 N/mm² to 480 N/mm², while for ST52.4, the tensile strength ranges from 490 N/mm² to 630 N/mm². Higher tensile strength means higher working pressures with reduced wall thickness, thus leading to reduced tube weight. The two different steel grades also lead to different yield strengths. The minimum yield strength for ST37.4 is 235 MPa and for ST52.4 it is 355 MPa. However, for steel tubes with an outside diameter that is less than 30MM and a thickness that is less than 3.0MM, the minimum yield strength is 10 MPa lower. There are also differences in chemical composition between ST37.4 and ST52.4. For example, the maximum carbon content for ST37.4 is 0.17%, while the maximum carbon content for ST52.4, is 0.22%. The high carbon content will make the steel harder and stronger through heat treatment. However, it will also cause the steel material to be less ductile and reduce the melting point. The finishing of tubes under ST37.4 and ST52.4 are NBK, where tubes are normalized, phosphated, and oiled inside and outside. Normalizing is a type of heat treatment process. Heat treatment done to change its the mechanical properties such as hardness, yield strength, and ductility. In the normalizing process, steel is heated to a temperature about 55˚C. This process will be continued over a period of time for a transformation namely grain refinement to occur. The steel then will be air-cooled in a room temperature. This results in the steel becoming stronger and harder. The specifications of the tube outer diameter and tube wall thickness are according to EN 10305-4. Below Hydraulic Steel Tubes Literature will shows the preferred outside diameter, inside diameter, and wall thickness.